We live in a world of keys, locks, alarms, and security systems. Paul's words shouldn't come as a surprise to us. We protect the things that are most valuable to us. What is more precious to us than the truth of God's saving grace in the Gospel. 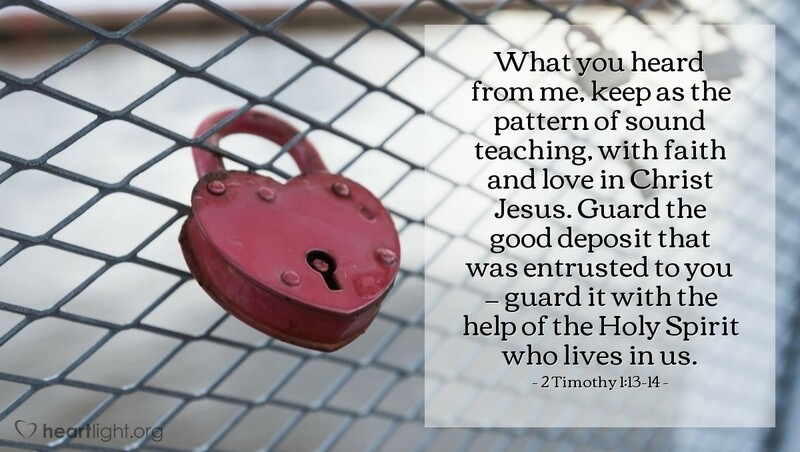 Thankfully, God has pre-wired all of us with a security system to help protect that incredibly precious hope. This security system lives in us. It is the Holy Spirit. Help me, O God, to not compromise your truth to legalism or license. I want to live, and show others how to live, a holy life. I want to share your grace and mercy with them. But most of all Father, I want them to join with me in welcoming Jesus when he returns. Please empower me by your Spirit to see through falsehood and error so I can protect and live your truth. In the name of Jesus I pray. Amen.